RUSSE B. LO, Lousa R .
conducti~!i~ of p i s ib~iiiile ex iiiii ments...........ii...... The~i admi i .......... i n ........ =isi n g~ agenc should ii i ..
..During the past 3, years, nine eparate sets of hearings have been. by committess of the House and Senate. member, reqttpsted that the subcommittee hold hearings on the issue.
" = = = = 1 = = = =+ "" = + .. .
such as a mammal and a bacterium. bidependently replicating smaller loopsof DNA known as plasmids. plasmid DNA and its circular form restored. The plasmid "vector"
the protein or other chemical for which it codes. D N A~ii m olecu lei~~~~iiii~~~~iii i!ii !! ~~iiii toi!i~ii an oth erii~iiiiiii~~~iiii iii! or an s m ig htii~i~~~iii~iii~ii cau seii~ii~~ii d iseaseiii!iiiii~~!! ini~ th e.i!iiiiiii~~i labora-iii~iiiiii~~iii~ii~~iii~i~i~~!i~~~i~ii~i "Hiiiiiiiiiiiiiii~i ~~iii~~i~i~~~ii i" ''..
-civation 61 a novel pathogenic E. coli. 1aborstory manipulations with DNA inserts. 44s"6d'ky'normal- chemical iabtivities in the intestine. of volunteers who in gested it. from ikaturally occurrmg E. coU strains was unsuccessful. pathogenic by processres which convert other vaxieties of E. coh. v ery-iiiiiiii~iii~~ii!~ d eecti v e o r a i m ev eniiii~ m o reiiiii en fe b le v a ria n tsiiiii~iiii~!! h a veii =i~=iiii~iiiiiiiiii b eenii d e-iiiiiiiii, ii= iiiiiiiii== ii ii =iii=""=iiiiii=iiii=iiiiiiiil=iiiiiii= ii ii==ii..
the rsk i no onge worh cosideing. stu d y......o..........e.c...m.n.d..u....e...ne.s..r................................o n .
and others generally agreed with this assessment. quired by the NIH guidelines appear to have been effective in pro-. gent containment appears to have an excellent safety record. the siritlike ve~y ele intermsof tese gidelnes. Numh 19. to seek his advice about the continuing use of the vector. the ouidelines." The committee approved a letter of complaint. mentary written report from the bioliazards, committee chairman. uncertified vector by their colleagues. Director Fredrickson lefV theo. the intent of the NIH guidelines. correct these deficiencies but will not have universal acceptance. Not. it was unlikely it could be~ read or expressd. The experiment iia&. If even a few scientists ignore the common gr .ound rules of researchi,. are discovered, they undermine public confidenc e in their enterprise..
technology will be feasible within a few years, much earlier thaw,. memorandum requested by, the chairman of the subcommittee. subdivisions unless the OSHA standards are voluntarily adopted. whetherii ori not .............. author== '===iii~i :::::::::::::::::::::::: =iing statute... specifically providers for envi-. n i mi t the.......o.w...r....o.....S.t...t...........................................................p o se sta vtd-i"'' ..
#htttated. For example, there have been various#proposals to appoint. complaUd its work, they favor short-term or "interim" I slation. ktivities could exclude certainkinds of experiments. biolo kal conttinment standards required by the Xi ily'1976 guidelines. uponi en ct en of....slti.,....guie.ies..ll.b..p.ica le..6..
a!nd s favait fhotvco sses ac eurngeaut! maintain compliance as soon as practicable after passage of legislation. t'hkough revle*, or be sqbj! rd to external ser4iny and 0,ontrol. lines do not specify their composition or appointment procedures. others as a mechanism for employee participation and public's crutiny. those who are doing the research." of the potential benefits of this new technology-"
InIte for public participation and political outlet for public opposition. Aurmt 25, M7), calling on the Cbngress "to preserve local autonomy,"
unposed in random fashion from State to State." (Statement of Gov. ih accord with the State's pubTleg he'alth statutes and regulations. ,Pavi&Newburger, professor of law at Washington University in St.
searcla, I cannot see any reason to preempt the area. expertise in the broad range of work with recombinant DNA. ........cm ite wil hav sufi inttmean.otvtinto.oior..
Womic and industrialsectors. Stetler of the PMA, Halvorson of the. M_ -itvi cot, ail beieploit elsehere. bre rigorous should be the procedural safeguards. lie-Y May entail heav an possi. meganic or iogniro subtane o atcuaoeuariett. Clift v. AEC (2 ERC 1779), Zabel v. Tabb (1 ER 1449), and EDF v.
g ftrd the environment could result in litigation. jilY To priate legislation to Congress. ... ... .. .. .
offered for the benefit of committee members and others. that the system can work without unnecessarily restrictive regulations. asszessmnent of the hazards, if any, associated with such research. does not support such action. ate rest7ricio& that ae't justifd6 h aad. Hence splicm-g, DNA from a distant source into -a bac. health problems. It seems almost certain that Watson will prove righ . nant DNA researchis widely understood. smotifie, professiow and the public are groping for a similar code. Nobel Prize In medicine for bin work on the structure of DNA. experiments that directly rlate to cancer. the elitist iinperialism of MIT and Harvard. a Ong, we always thought we were on their side. lixkti* we should have no reason to be concerned for our health. must be negligible compared to UStUM9 Zi 1 om'rringr DNA transfers. always opt for the worst possible scenario. fthe most troglodytiq of our industrial firins.
.(4) Section 361 of the Public Health Service Act (42 U.S.C. itids was thought to be an essential element of any regulatory effort. Also, in order to meet the specifications of the Act, recombinant DN.A. t h e ... . .. .. .. .. .. .... .. .... .. ..... ... .... .............. . . . .. .. .. . ... .. .. .. .. . .. .. .. .. .. .. .. .. .. .. .. . .. .. .. .. ... .. .. .... ....... ........ ..
c e s .. ...... . . .. .. .. ... ... ..... ... .... .. ........ ....... ........ ................. ... .......................................... . .. .............................. .. .
Va8hington, D.C., May 12, 1978. To: Hon. Harrison H. Schmitt. 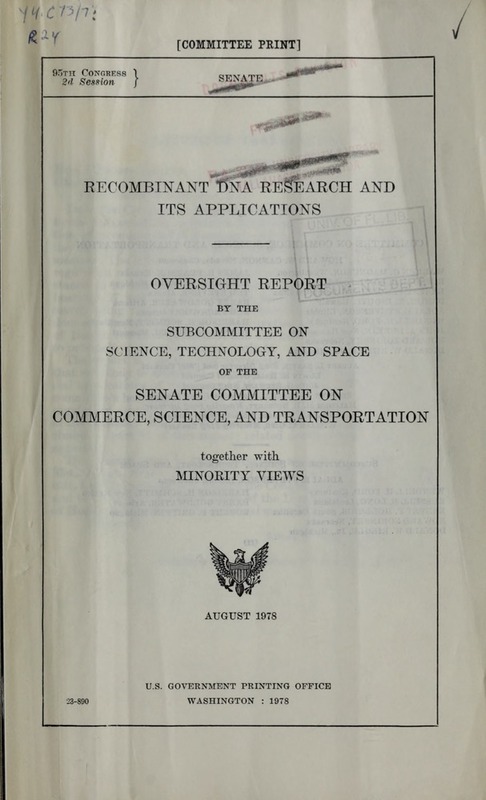 Tublic Health Service Act to recombinant DNA research. Several of your questions deal with Section 361 (42 U.S.C. 264). refirs to the prevention of the spread, etc. of communicable diseases. that scientific research was to be pervasively ragukt4. and In 1944 (58 Stat. 703.). s This language is f rom the House report accompanying the 1944 amendments. 3 pow of C on gress is the ultim ate touchstone." R etail o k V.
under th P~ublic Health Servce At. dures for inspections are set out by Congress in tpn gli i. Under the Public Health Service Act. we souldhaveno easo to e cocered fr ou hiiih. lectual inquiry and a presumption against governmental interference. action rather than the expression of ideas. stitutional provisions would cable to such regulation. intended when the law was enacted. volved, careful scruthky 8 required in delineating the goope. American Constitutional Law, by Laurence H. Tribe (Mineola, New York: 1979 p.
that new and specific legislation wasned. iilaiy n light of the active interest the Congress has shown inthisarea. research....n....u.a..e..pr.d.cts....... r c in.......................................................A is in volved . pared to use already existing powers. would like to do instead. Nor is the Adistaonllfoemn. Other parts of the Adminis ion, eo . Wa-4ington, D.C. 7 May 4,1978.
production of enzymes for industry, and agTiculture. 3. Could Section. 361 be used to cover the private sector? Yes. 5. What are the authorities of the Secretary under Section 361? for essentially all of the functions you name. specific bills than under Section 361.
single authority, with DHEW the clear lead agency, might well be adequate. Rogers is reviewing the Administration's proposals along with other alternatives. Now let me turn to the other two issues you raised. committees with public members, and sanctions for violations of guidelines. of compliance with DNA regulations in order to approve new drug applications. W1 seem adequate for the workplace at present. any apparent need to preempt existing statutes. following the development of this research and its applications. 'Washington, D.C., rowarV 6, 1978. Office of Science and Techtw1ogV PoMV, Washington, D.C.
Itegister of November 18,1972 (37 P.R. 24670). jmd impose additional requirements on the sale and shipment of these turtles. regulation Is discriminatory because there are no other comparable regulations. Section 261 see United States v. Shinnick, 219 F. Supp. 789 (E.D. N.Y. 1963). Water Standards have been enforced as the national standard since 1962.
blood practices, in minute detail, in order to preventcomnabedss. which provide extraordinary detaild requirements, are enclosed. j1udgment, to establish the potential for harmthtireuednerScon3. 1 ......................................... ............. .....i ........ ........ .. .......i i..
e v on en t a l a s p e c ts o f t h e m a tte r E n v ir o n m e n ta l D f e n M F u n d I n c v .
.............................................. ................................ dioc c u r .
*Washington, D.C., December 3, 1977.
to directly control organisms containing recombined DNA. would be subject to regulations by APHIS.